Many of these chicken salad recipes make delicious everyday sandwiches. Or serve them as luncheon salads or on small buns or rolls as party appetizers. 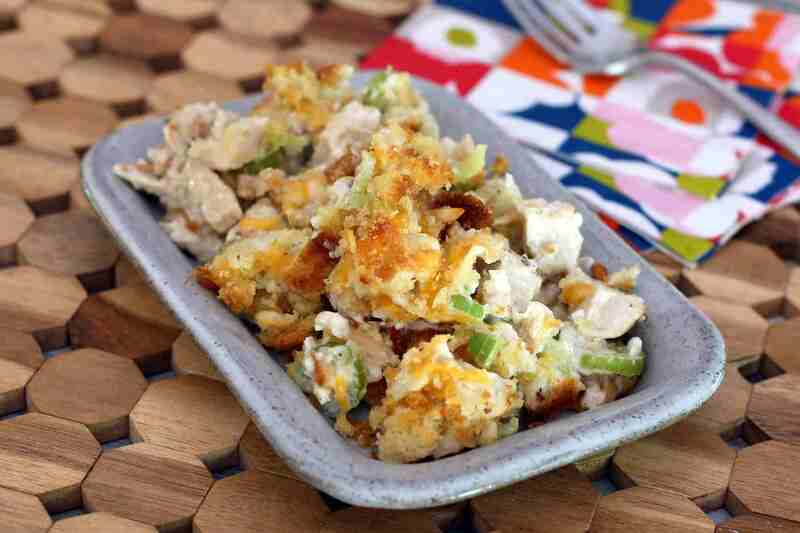 This old-fashioned oven-baked chicken salad is a casserole made with chicken salad ingredients and a cheese and bread crumb topping. This chicken salad takes on extra fresh flavor with roasted chicken breasts and fresh chopped herbs. Serve the chicken mixture in sandwiches or in lettuce wraps for a delicious lunch or light supper. This lovely chicken and rice salad makes a tasty and appetizing lunch or dinner, and it's perfect for any day of the week. It's an excellent picnic salad, too! Use a rotisserie chicken or roast a small chicken to make this delicious salad. It's wonderful in pita pockets and it would be great served on lettuce or spring greens as well. This is a classic Southern chicken salad with dill pickle relish and some chopped hard-cooked egg. Serve this yummy chicken salad in sandwiches with lettuce, pickle, and tomato slices, or pile it on lettuce for a delicious lunch. For a sweeter flavor, use sweet pickle relish instead of dill. This is a well-seasoned chicken salad with curry powder and some chopped apple. Use it in sandwiches, small appetizer sandwich rolls, or as a luncheon salad on lettuce or salad greens. Use leftover cooked and diced chicken or a rotisserie chicken for this tasty salad recipe. The recipe is quite versatile, so feel free to change some of the ingredients to suit your taste. Spinach can be replaced with arugula or baby kale, and the onion can be omitted if you aren't a fan. Turkey, ham, or tuna can be used instead of chicken. Sweet bell pepper relish adds zing to this basic chicken salad, but sweet pickle relish or dill relish would be excellent as well. Chopped walnuts or pecans and chunks of apples and cranberries add crunch and texture to this chicken salad recipe. Feel free to change it to suit your taste. Serve this delicious chicken salad in ciabatta bread as a sandwich, or serve in lettuce leaves for a lighter luncheon. Light mayonnaise may be used in this salad. This grilled chicken salad is made with an amazing herbed sour cream and mayonnaise dressing. Serve this salad with a cup of soup for a tasty and satisfying meal. Use a grill pan or skillet to cook the chicken breasts or use sliced fried chicken or broiled chicken. This cajun chicken salad recipe is made with celery, green onions, chopped pecans, fresh parsley, and some Cajun seasonings for a Cajun kick. Some lemon juice flavors the mayonnaise for this is a basic, simple chicken salad. Chopped hard-boiled eggs add to the flavor and texture. This is an excellent salad for sandwiches.